You may not think the apex of cool is a multi-colored scarf. Or a bow-tie. Or both. Unless you’re a Whovian, of course. Doctor Who is listed in the Guinness Book of World Records as the longest-running science fiction television show in the world, and as the “most successful” science fiction series of all time (in terms of its overall ratings, DVD and book sales, and iTunes traffic). The show has earned acclaim for imaginative stories, creative low-budget special effects (although these have improved over time), and its pioneering use of electronic music. As Doctor Who builds towards its highly-anticipated and climactic 50th anniversary year (and 14 big, blockbuster-movie episodes) things couldn’t be brighter. Why? Because sci-fi fans are cool like that? Nope. It’s not just the genre. It’s the storytelling. It’s the triumph of good over evil. It’s the life and death plots. And it’s because weeping angels are just, well … fascinatingly scary. Obviously, the writers of this show know what they’re doing. Here’s what you can learn from them about developing timelessly delicious content. The Doctor is a god-like hero. And not just as metaphor, but as one we can see and understand. He loves humans more than all the other creatures in the Whoniverse. He would die for us, if it came to that. The bottom line? The Doctor is over-the-top helpful. He cares. And he does whatever it takes to save the day. Your content needs to be the same. Your audience is struggling with real problems — sometimes they might even be the life-and-death serious kind. Don’t just tell someone vaguely what to do. Give them actual steps to get it done. Use a tutorial, a template or a video; or at least make sure you point them to the exact resources where they can get what they need. The TARDIS (which stands for Time and Relative Dimensions in Space) is the Doctor’s super-vehicle. A properly maintained and piloted TARDIS can transport its occupants to any point in time and any place in the universe. And if that weren’t special enough, it’s a living, organic being — created especially for the Doctor, himself. The bonus? Because a TARDIS’ interior space exists in a different dimension from its exterior, it appears bigger on the inside. Your website is your TARDIS. It’s your vehicle or platform for delivering all that juicy content across the web. Its interior size is limited only by your imagination, and can have as many rooms as you need to tell your story. You should know your site like the back of your hand, and keep it properly maintained. Time Lords have a non-linear perception of time that allows them to see everything that was, is, or could be at the same time. Create cornerstone content that isn’t bound to any particular timeline. Focus on telling the truth — not telling what’s true now. This makes your content “evergreen” and relevant long after other types of content have ceased to be relevant. Tell stories with real characters. Don’t forget to include detailed portraits of the villians and aliens you’re battling on behalf of your audience. Help them find the courage to take a stand against evil — in whatever form it takes in their lives — and you’ll go home safe and happy at the end of the day. Time Lords also have the ability to regenerate their bodies when their current body is mortally wounded. This process results in their body undergoing a transformation, gaining a new physical form. Once you’ve poured your heart, mind and soul into your blog post, it would be a shame to let it languish in your site archive, collecting dust. Record a podcast — Narrate your blog post as is, or invite an appropriate guest to discuss one aspect of the content in more depth. Create a white paper or special report — If the post itself isn’t too long, you may need to supplement with data and/or images. These are great as a downloadable gift or enticement for list-building. Create a video — Record yourself delivering the content highlights for a short video (2 minutes or less). If necessary, you can record an entire series and deliver them as part of an opt-in list-builder. Create a slide presentation — Find a series of strong images, and use them — with or without music — to present your ideas in a slide presentation. Upload the slides to slideshare.net and then embed on your site and share via social media channels. Deliver a webinar or in-person presentation — Use your slide presentation for this and add your special report as a handout. Article — Revise the post so that it speaks to another subset of your target market. Submit it to an article directory like eHow, or to Squidoo. Guest posts — Revise the post to meet the needs of another blog’s audience and submit as a guest post. Be sure that the blog knows your submission is based on your original post. eBook — Package together with 7 to 10 similar themed posts, write an introduction and a summary wrap-up paragraph, and save as a PDF. EBooks can be used for free promotions, or as introductory products. Audio Book — Narrate your eBook and record as an mp3 or series of mp3 files. Inspirational Quote — Pull a quote or two and use as a Tweet and/or other social media share. Include a link back to your post. You could also create some swag (like a t-shirt or a bumper sticker) if the quote gets a lot of positive response. Infographic — Create an infographic using the data or steps outlined in your post. Pin to Pinterest and include embed code for ease of sharing. Once you’ve exhausted the new lives of your blog post, consider pulling everything together into one signature info product or class. Who says you only get 11 lives? The Doctor has a gadget he never leaves home without: his sonic screwdriver. This complex piece of technology — a portable device that allows him to do everything from pick locks to perform medical scans and control other devices remotely — is more than just a fancy tool. It’s another vehicle that facilitates the Doctor’s mission. You have one, too. It’s called a smart phone. Make sure you understand all the nifty things it can do for you and how your content looks and acts when viewed on its lovely little screen. People are shifting away from their clunky laptops and desktop computers to read and engage on the web. This means your site needs to work properly on a mobile device — or your content is dead in the water. It might only be sixty minutes of wildly dramatic adventure, but during that time, Doctor Who manages to capture your attention, involve you in the storyline, and hook you into wanting more. The secret? A three-dimensional look at the lives and morals of aliens and humans — both good and evil. Doctor Who writers create raving fans because they tell meaningful stories that entertain us at the same time. This, above all else, is your mission, too. So whether you’re a Third Doctor fan or a Tenth Doctor fanatic, the Whovian recipe has some time-honored ingredients that can help you cook up your own timelessly fascinating content. Best way to begin? Decide on a destination, check your instruments and take off! About the Author: Tea Silvestre is a sci-fi geek, a marketing coach and the author of “Attract and Feed a Hungry Crowd: How thinking like a Chef can help you build a solid business.” You can follow her musings on Twitter at @teasilvestre. Learn how she regenerated her blog content into a published book when you take her free e-course: “From Blog to Book in 9 Simple Steps“. Thanks for a great post Tea. I love that quote 🙂 he’s always right when he says it as well. Well-written piece. Now I have to be honest, I don’t know who Doctor Who is, no pun intended (or maybe just a little). But your post definitely peaked my interest. Your list of advice on number 4 is really meaty and i could definitely use if for my site. And for that I could you definitely are a hero with this post. Thanks Allan! Let me know if it pushes you to watch an episode or two. …STORIES. Like Tea said, it’s absolutely a fantastic way to spend your time, and there is a LOT to get out of it. Not only that, it’s constantly touching on deep, humanistic, universal principles that rock. Allan, I agree #4 caught my attention most. It’s easy to forget how much content can be recycled. My mind is spinning with ideas. Doctor Who would be proud. Love the timeless and repurposing. I need to be more strategic on repurposing great posts that I poured myself into. Thanks for propelling us into a time when creativity – thinking outside the box is honored. Need more of that. But seriously – thanks for the comment, Teresa. Repurposing/regenerating is a highly intelligent way to go. Great post. Don’t know why I never really got into Dr Who – I am SUCH a sci-fi geek-girl in every other respect. But it’s a great meta structure for the whole content-palooza thing that can be so overwhelming for any biz owner. We could all use some more of #1’s attitude, I think. It’s so easy to get wrapped up in the production of content and lose sight temporarily of the purpose behind it. Agreed, Annie. If we truly care about our audience and their challenges (and then HELP them), we’re more than half-way there. I love that you compared content recycling to regeneration, but it’s a great metaphor! The message of the content stays the same, but the format changes. Just like the Doctor is still the Doctor, just updated. EggsACTly, Nick! Don’t let all your hard work go to waste! Great post, Tea! I’m not a big Dr. Who fan, but I found your section on repurposing content particularly helpful. Would love to see more from you about that subject! Tea, as always, has delivered some amazing ideas in true geek form. Half of the ideas in the Regenerate and Repurpose section can land you new clients overnight if used properly. Allowing your best content to languish just isn’t smart business, and I love how Tea just puts it all out there. Also, as an aside, one of the most important points here: Tell Stories. The more you tell stories – making the problems that your customers face real, actionable, definable demons – the more valuable you will be to your market. Thanks, Nick! Traveling the Whoniverse in a TARDIS — as a biz consultant — HAS always been my dream. It’s the storytelling that makes your business easy to share with others, regarless of the delivery medium. Whether it’s a smartphone or the other 11 delivery vehicles you shared, the story is the key. People love to tell others about the stories behind the junk that we buy. From the shoes on our feet to the yogurt in the fridge. If it’s got a great story behind it, there’s a much more repeatable message that there is if you just list a bunch of benefits and call it a day. Great post… now if I could just fix the flat on my own TARDIS. “Pinky and the Brain” used to be our marketing department’s theme song (late 90s, don’t judge). But yes, Joshua – stories are what makes the world go ’round! I agree with Nick and Allan, your Regenerate and Repurpose list is excellent. All we have to do is implement them with the ruthless focus of a Dalek. Obviously Jon Pertwee was the best Doctor, followed by Tom Baker and David Tennant. As a Whovian and a Blogger I love this article! It is a great way to look at content and how to keep it fresh. Thanks! Ohhhhh “Dr. Who”! I was like, “There is something very wrong with this title…”. 🙂 Great post, thanks! I’m not familiar with Dr. Who (how can this be?) but even so, the analogies and suggestions make total sense. I particularly like the Regenerate and Repurpose List. I’m always up for new suggestions of things to do and there are plenty in your post. Well done. Watch it. Watch it NOW. This is why the Doctor is bad@$$. I defy anyone to watch this and NOT fall in love. Great marketing ideas and a big reminder that small business owners need to stay on top of technology. Definitely agree that we need to start thinking MOBILE for all the content that we produce because that’s where so many of our readers and potential clients will see it first. Big YES VOTE for Sonic Screwdrivers! Thanks Tea. 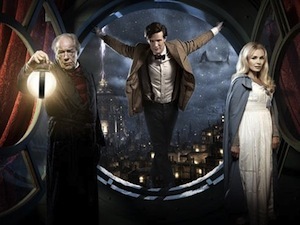 I agree, it is the storytelling that makes Doctor Who so timeless. Developing the ability to tell stories and integrating that into our content is what will make our websites live forever. But it is a lot easier said than done. It takes determination. Even when you create a dud, you need to learn from your mistakes and keep trying. There have been a lot of Doctor Who duds (I know, I’m a big nerd and have watched everyone that has been available on Netflix), but the creators of Doctor Who have kept on telling stories, learning from their mistakes and refining the process. That is what we need to do if we want to learn to create great, lasting content. Right, Mickey! Storytelling is a real skill. And the best stories are the ones that use emotion to draw us in. Here’s to big nerds everywhere getting in touch with their inner-storyteller. Nice to see you here Tea! Wonderful post indeed and explains a great deal too! It sure goes by a lot what Doctor Who suggest about developing timelessly ‘delicious’ content. Tea–excellent post! Like the way you were inclusive in your writing for fans and non-fans, alike. Dr. Who has been in the background of life for a long time but only recently discovered it as a fan. You have made some apt links. Thanks for the many blog suggestions. Thanks for the list of ways to repurpose content – very helpful. And love the Doctor Who analogy! I know it’s not pronounced the same but your first name (I love your first name) is spelled the same way as my favourite thing in the whole wide whoniverse. thanks for sharing this, great job! Great post! What a clever idea to borrow the story and character of Dr. Who and use it to illustrate the principles of better blogging! Being your audience’s hero, using your website well, and having a good sense of what you’re doing with your content—you’ve provided some great advice for “the journey.” Nice job with this piece! Although I’m not a Dr. Who fan, I still could follow and benefit from your tips. I love the 11 tips for breathing new life into a blog post. Those will keep me busy repurposing content for quite a while. Thanks Tea for the great analogy. The cybermen kept me hidden behind the sofa but this was certainly worth lookin at. I must be honest, never watched an episode of this but I love the ideas that seem so fresh. It appeals to my non conformist nature. I look forward to putting some of these into practise. I didn’t know or care about Dr. Who until this post. Now I’m curious. But I’m even MORE curious about breathing life into old posts. We get better with time and lots of practice, and quite frankly, I’m embarrassed by some of the stuff I put up back when I started. Now I have an idea what to do with them. Thanks for this, Tea. You can bet I’ll be following your own blog too… and good luck with the business side of it. See you in boot-camp! Thanks Rodney! Glad I could peak your curiosity about The Doctor. You won’t be disappointed. Also, those old posts CAN get better with age IF we go back and revise them as needed. All of that experience and knowledge you’ve garnered over the past months/years can really make a difference. Especially love the post and the “Regenerate and Repurpose” list. Thanks so much for posting this! It made my morning! Great tips for regenerating and repurposing posts. You have inspired me to look at all of the content that I have already created with new eyes. Tea just like Doctor Who, you ‘managed to capture my attention, involve me in the storyline, and hook me into wanting more’. That was packed with really good ideas. Thank you for the inspiration to think of things in a new way. I love the idea that your website is your vehicle. I’ve never seen Dr. Who so I thought I might not get it. Believe me, I GET IT now! So glad you enjoyed it, Carol. It’s always a delicate balance to write something for fans that non-fans will get, too. My evil plan is working! ((rubs hands together)) Thanks for stopping by, Colleen! Love it! I definitely used a Doctor Who/TARDIS analogy when I was creating + launching my current biz. Love the idea of “regenerating” content, I need to remember that more. Work is always more fun + approachable when nerdy metaphors are applied! Allons-y! Checked out your site, Ainslie. Very cool stuff. Keep at it! I’ve been a Dr. Who fan since I was 4 or 5 (Jon Pertwee was my first doctor, Tom Baker was my ‘main’ doctor, and I have a serious soft spot for Peter Davison; I wonder if that’s where David Tennant got inspiration for his emotionally tortured portrayal? Aaaanyway…) so this article had my full attention from beginning to end! I especially loved the regeneration section. I’ve had a go at that, putting 3 old blog posts together into a ‘how to’ that I give away as an enticement to join my mailing list, but I’m sure there’s more new life to be breathed into my old content. Love the idea of pulling quotes from old blog posts. I’ve admittedly never tried that one! I’ve also never watched Doctor Who but am now inclined to check it out. Good stuff thanks! Tea, this is fantastic! Rick from our team is quite the Dr. Who fan so he’s been encouraging me to check it out. I’ll definitely do so sooner than later 🙂 And as always, excellent marketing advice. We’re working on our cornerstone content right now. Thanks! Great ideas for repurposing content. I think content distribution is a key part that so many of us miss, because we are always trying to produce new content. I especially like the e-book idea, pulling together themed posts and popping them into an e-book is a great way to bring in revenue. I’ve actually never seen Dr. Who- but thanks for bringing his whole wacky world into mine. 6. When in doubt, reverse the polarity of the neutron flow. Tea, I’ve been wanting to do a Dr. Who related post for a long time, and I’m thrilled to see yours. All your points are “spot on” and I agree with Nick, Nick2, Allan, Steve and the rest — regenerate + repurpose FTW. I love how this content’s shared on CopyBlogger, I think it’s a great fit, and it’s interesting to see how many people comment who *arent* into the show (yet). You rock, Phil Collinson (diretor of the new series) rocks, and CopyBlogger rocks. Hey Jason, thanks for the comments. I agree – watching TV can be immensely useful…IF we look for the lessons and think critically about the story lines. Plus, didn’t Mr. Morrow himself once talk about how much he learns from watching the tube? If it’s good enough for him, it’s good enough for me. I’m not a Community watcher myself, but I hear it’s gaining quite the following. Seek and ye shall find, eh? Oh you clever fan transferer you. As a huge Doctor Who fan, I would like to add a few. * He never gives up, even against insurmountable odds. We saw in one episode that just one dalek was powerful enough to take over the Earth, but many times he has single-handedly fought a whole army of daleks. * The Doctor never tries to be cool. He’s completely himself, even when that’s extremely dorky. We love him for it. * The show doesn’t talk down to the audience. Doctor Who writer Steven Moffat was told that he should make his stories simpler, because the audience wouldn’t understand something so complex. Moffat refused and the fanbase got more devoted than ever. * It’s unapologetically imaginative. Instead of using safe stories and settings that have worked for other shows in the past, it constantly breaks new ground. Some episodes bomb because of this experimentation, but when they hit, they have something unbelievably unique, special, and unforgettable. That daring is what makes the fans so devoted. Love these, Runebug! Thanks for adding to the post! Wow, Excellentt article. Love the tips in regenerate and repurpose. Another keeper Tea. This is the take out for me: Your audience is struggling with real problems — sometimes they might even be the life-and-death serious kind. Help them! Don’t just tell someone vaguely what to do. Give them actual steps to get it done. Your post is brilliant testimony to this directive, providing help for your audience in so many different ways, including getting them to think outside the TARDIS or perhaps it’s inside the TARDIS! Thank you. Brilliant post! I am a huge Doctor Who fan and have watched it since the very beginning! What a great way to present these ideas…now, it makes sense! I have printed this out, twice, so that I have easy access to it as a reference. Thank you! Twice! Wow, Sherie. You honor me. So glad you enjoyed this one. Briliant Post! As a young mother I ended up watching the good Doctor. Why? Could I have a five year old who wanted to watch Sesame Street? Heck no! Mine was glued to Dr. Who. Reruns or not, she was fascinated. Which of course meant I had to watch with her! Once again the brilliance of this seemingly simple television program delivers a message with depth and flair, as does this author. Kudos to both! What did I learn from Dr. Who? How to think outside the ‘Tardis’ or the box if you will. Thanks Nancy, my son liked to watch “Hook” over and over and over again…so now we both know the dialogue almost verbatim. Funny how kids will affect what we pay attention to, right? Tea, my kids are so how I ended up blogging. As the total non-tech person, I had no idea how blogs worked, but I was looking for a place to ‘file’ all my research for my daughter’s wedding… blogger seemed easy enough to use (and easy is critical here! I’m so LOW tech) But all of a sudden I noticed I was getting comments, I was entranced! Someone actually read my often irreverant comments in my ‘posts'(what did I know about posts?) So I learned, and I’m still learning. But the fact is, I wouldn’t be blogging at all if it weren’t for my daughter (tho not the Dr. Who daughter). Kids truly do influence me in huge ways! As do you! Again, great post! Shared the link with the social media group I belong to. Thanks Tea. Zeus here, from over at the Bootcamp facebook page. You did an excellent job with this. Very useful to me, especially since I have impactful stuff that could use different formats (love the “regeneration” moniker because it is not recycling any more than making a movie out of a book is recycling) AND am just getting together an e-book. We’ll have to talk, and even engage your services since I’ve been able to produce high traffic content on guest blogs, but don’t really know how to technically package my own website to take full advantage. Great stuff. Hey Zeus! (sorry, couldn’t resist that one) Will follow up with you off-page, but for now, thanks for coming by and expressing your enjoyment over this one. Means a lot. First I’ve got to let the Trekkie in me come out and play. Dr. Who does have Trek beat on time (first episode was 1966), but does Dr. Who really beat the Star Trek franchise as a whole (Original, TNG, DS9, Voyager…)? For the work stuff, I agree with the others, point four is outstanding and I’m bookmarking now for future reference. Thanks Tea! Not sure about franchise vs. franchise. But if we compare them, DW has some not-insignificant spin-offs as well. Tea, I love your repurposing ideas. Your list totally got my creative juices flowing in that department. Question for you: do you think guest posts (for ex. your post here on Copyblogger) could be included in eBook? Hi Shawn – glad to hear the post is working its magic on you. IF you get permission from the site owners where you guest post, then yes, you could include them in other materials. Each site is different and will have their own requirements regarding reprinting and/or publishing elsewhere. Storytelling. How is it we forget how powerful stories are and how as humans, we so easily can relate to them. You always have such refreshing, unique, easily “digestible” ways to look at our businesses, Tea. I love the whole idea of “Tardis.” I hadn’t thought of my website in quite that way before. Thanks so much. This post was not only delightfully entertaining to read, but full of great advice on how to deliver better, more useful content. I will definitely use the suggestions here. The weeping angels are by far the scariest monsters in the Whoniverse! Thanks for the tips! Number 4 by itself is great advice. I’ve been doing a bit of this but not to extent or as consistently as I could/should. It’s time to change that. I’m going to go back through my posts and identify some that might be good candidates for resuscitation. I’ll also keep this in mind for future posts. It seems like I’ve been hearing about this Dr Who show quite a bit recently so I was already a bit curious. This just put it over the edge. Luckily its available on Netflix; I’ll check out a few episodes.